he just makes him more nervous. arena, where he does his best to help Timmy get into the team. the fart isn’t a cheap trick. In fact, the fart has two roles, he is Timmy’s imaginary friend, so he talks and listens, but he is also a fart, and the plot utilizes this fact in a most convincing way. 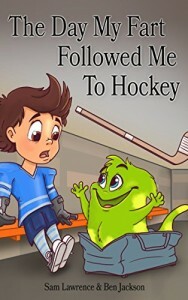 relaxing read for little boys and girls who are intimidated by team sports. However, I feel that the illustrations diminish the message of the story. They are banal and don’t reflect the emotions very well.